Search any expat blog about Germany and you will inevitably come to an article concerning the rudeness of Germans. Sometimes these forums will ask why Germans are so direct or they attempt to answer why German people seem so cold or aloof. Popular opinion online seems to be that Germans are culturally programmed to be impolite, especially to people who are perceived to be outsiders. Alternatively, there are those blogs and forums that discuss, with amazement, how friendly the Germans are and how the Germans they have met are entirely unlike the German stereotype they expected. Stereotypes, as I have mentioned before, are by their very nature oversimplifications of a culture. They do give us a basis of understanding, but they are not a comprehensive way of understanding what makes a country tick. It very much depends on context and a sense of empathy, and also our own cultural baggage. For the longest time, I believed Germans to be rude and impolite, because they did not conform to my understanding of politeness. 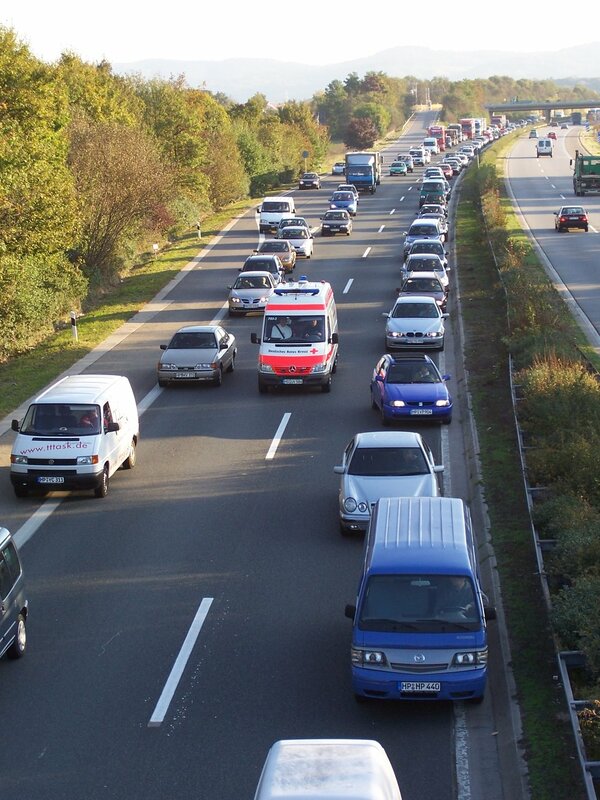 For example, I was recently stuck in a traffic jam on the Autobahn. My navigation system was telling me that I might be there for a while, possibly more than an hour. I had stopped my car and edged it slightly to one side in case an emergency vehicle need to get through. As I sat there daydreaming, I noticed that the man in the car behind had got out of his vehicle and was headed towards me. This is not uncommon during prolonged traffic jams, when the roads are blocked and there is no movement, people will often stretch their legs, answer the call of nature, smoke or share information on the delay with other drivers. He walked up to my window and tapped on the glass. As I rolled down the window, he informed me that I must move my car over in order to let emergency vehicles through. I looked in my rear view mirror, shocked and worried that I was blocking an ambulance or the police. Of course, when I checked, there was nothing there. As quickly as the man walked to my window, he returned to his car. I was furious and I felt my face flush red. Who the hell was this busy body? Did he not notice that I had already moved over? How rude! Well, perhaps he was being rude, then again perhaps he thought he was being helpful. In the UK, this interaction would be an example of someone not “minding their own business”, maybe an example of someone “overstepping their mark”. That is because an essential part of British life is not making a fuss and certainly not pointing out when someone is doing something incorrectly. The irony of British society is that there are thousands of people pronouncing things incorrectly, following the wrong procedures and completing the wrong tasks, who will never be corrected because people consider it impolite, it might make an awkward scene or it might make a person feel a little stupid. In reality, it was just as likely that my mystery corrector was actually trying to help me avoid an unpleasant situation. Perhaps he noticed that my number plate was from a different region and he assumed I might not know the correct way to do things. Perhaps he simply saw me doing something incorrectly and felt I should be told the right thing to do. This might be direct, when we filter it through the sensibilities of the UK, but it was also honest. Honesty, in Germany, has a lot more currency than being polite. When people complain about German impoliteness, they will often point to a particular interaction, usually in the context of customer service. The trope is that German customer service is terrible, shop workers are sometimes rude or actively belligerent. I worked in UK retail for almost a decade. We were exactly the same, however our rudeness was masked by sarcasm, tone of voice and word choice. Customer service is a world of passive aggression, on both the employee and customer sides. I can say 'certainly, would you like a hand with your packing' in a hundred different ways, only one of which is actually sincere. British communication is inherently dishonest, because we can manipulate the tone so subtly. In addition, as a veteran of retail, I can tell you with some certainty that the majority of customers (myself included) are morons and sullen acceptance is surely the only realistic reaction to any customer request. Context also plays a part in how we understand politeness. I went to the bakery about a month ago, looking to buy some breakfast bread for my wife. In German, I asked the cashier if she could suggest a suitable type, as I really had no idea which one I should buy. The lady behind the counter patiently waited for my sub-par German sentence to eventually creak to an end and then proceeded to explain the many varieties of bread that she had, settling on a Volkorn loaf topped with sunflower seeds. I thanked her for the useful information and then asked if I could have one of those. She looked at me, shrugged and said “Sorry, we don’t have any of them left”. Again, my first reaction was to be really annoyed at what some people would say was a typical German customer experience. However, the context of our discussion, my question and her answer, were on totally different planes of existence. I thought my question was clear, due to the context, and that I was expecting her to list off all the bread options she had. Her answer was to tell me about all types of bread, not simply the ones in stock. She was giving me a well informed answer, based on all possible options. No one was really at fault, however I could easily have just put this down to rude Germans and left the bakery empty handed. If we judge Germany by standards set from outside, we do it a disservice. Americans and to some extent, the British will always consider Germany to be rude, because German politeness never takes the form they expect. You rarely hear people call each other sir or madam, people probably won’t say “excuse me” as the barge past you at a Christmas market and shop workers never take you by the hand and walk you directly to a product, while airily chatting about the weather. However, walk into any waiting room and people will happily say hello to you, young people frequently give up their seats on public transport for older or infirm passengers and when people say “thank you” (Danke), the response “you’re welcome” (Bitte) is not far behind. Germany is politer than you think, you just need to know what to look for.